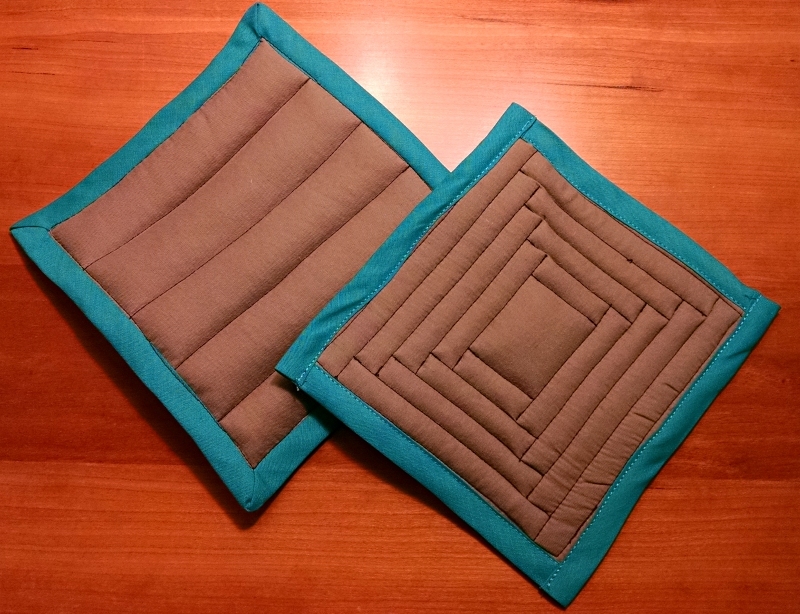 Today’s craft project was potholders! I made one of these a few years back, just to see if it worked, and not only did it work, it lasted way longer than I expected! However, last night it got rather singed and the bias tape on it started cracking, so I decided to make a couple more today. Behold their majesty, before they inevitably get stained. I cut out 5.5-inch squares of the batting and two pieces a big bigger of the cotton. I sewed around the edges to make what looked like a tiny pillow at this point. Then I sewed some lines in the center, like quilting, except I’ve never actually done that so I don’t know if that’s really what I was doing (but I tried to make one of the designs kind of interesting?). If there was any batting sticking out, I trimmed it off, then trimmed the cotton edges down to about 3/8-inch. Then I put the bias tape on. You’ll notice in the photo I attempted to do one of them with nice mitered corners and stitch in the ditch or whatever, and then in the second one I just cut pieces and topstitched down. Both methods done imperfectly—they’re functional, not necessarily beautiful.) Squash them down a bit with an iron, and they’re done! Just to reiterate: these are not super-heat resistant, so don’t use them with, like, cast iron. But they’ll work well enough for taking cookie sheets out of the oven, or taking from the microwave a piping hot bowl with soup in it that is hopefully also piping hot (but is often deceptively tepid).